One of the greatest names Plovdiv is so proud of - Joseph Schnitter (born 1852, Novi Bidzhov – died 1914, Plovdiv), a Czech by original nationality, an eminent architect, engineer and geodesist – the greatest constructor Plovdiv has ever had. He had graduated the Construction Faculty of the Vienna Polytechnic University, and then he participated as a volunteer in the Russo-Turkish War. Prior to signing the San Stefano peace treaty (March 3rd, 1978), Joseph Schnitter had been sent to Plovdiv. After the Liberation of Bulgaria, and after the withdrawal of the Russian troops from the East Roumelia, he first started a private practice in Plovdiv and a bit later the same year, 1978, he was appointed the Chief Engineer and Head of the Technical Office of the Plovdiv Municipality - a job he performed until his death in 1914. - the Main Girls’ College (1879-81) – today The National Art Gallery, Plovdiv, at the 14 Suborna Street in the Old Town. The building had been initially designed by Schnitter for the Girls’ College in Plovdiv, in a New Renaissance style. Later the building has been adapted to be an art gallery (the photo below). - dozens of private houses, among which Yoakim Gruev’s house. He ardently supported the Unification of the Principality of Bulgaria with East Roumelia (sept.6th, 1885) and participated in the Serbian-Bulgarian War of 1885, again as a volunteer. - The belfry of the “St. Petka” Church (1909-10). All the buildings he designed or supervised the construction of are impressive even today with their classic monumental beauty. Joseph Schnitter’s greatest achievement, though, is the General Regulatory Plan of the town of Plovdiv, considered the very first contemporary town-plan of Plovdiv, worked out in the period 1888-91 and officially approved by a decree of the Knjaz of Bulgaria in 1896. That plan gave a solution to communicational and infrastructural issues of the town, created a key green system and preserved the architectural heritage, so essential for Plovdiv. Joseph Schnitter accepted Bulgarian nationality in 1906, and after 36 years of active creative work for the benefit of his beloved Plovdiv, he finally died here as one of the most respectful citizens of our town - on April 26th, 1914, at the age of 62. 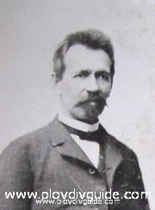 During all his years of ardent and devoted work, the Chief Engineer of Plovdiv had had an endless fight with the unscrupulous and greedy construction entrepreneurs and bribed bureaucrats (some of them trying to build houses using clay and mud instead of concrete) who, wishing to get rid of Joseph Schnitter, repeatedly claimed his resignation, accusing him of being “too pretentious”, “nagging” or “over-ambitious”. Some of those accusations are hovering even today since the abyss of passions born by interests is bottomless …. But the worthy answer to all those passions had been given once and for all by the 1928 earthquake, which destroyed three-fourths of all the buildings in Plovdiv... Among them there was none of the buildings Joseph Schnitter constructed! Having not received even a crack, those houses, all built at the end of the 19th and the turn of the 20th century, have stepped intact into the 21st century!